I use atmega32u4 (but believe it applies to all models). Here is the datasheet. connect a 10cm wire to PB5 pin (the other end of the wire is in the air): the result is that sometimes after poweron the led is on, sometimes the led is not on. do not connect anything to PB5 pin: the result is that after poweron led is never on. I have a standard setup. Nothing tricky. If it does not work reliably, this gotcha MUST be documented in datasheet. This setup is supposed to deal with a stupid button. But sometimes it detects a keypress while there is no keypress. The question is: where in datasheet there is a warning about this gotcha? And did somebody come across such case, or I'm the first in the world? EDIT See also this question. did somebody come across such case, or I'm the first in the world? You are not the first. I recently got bitten by the very same issue. However, unless you are close to an unusually strong radio source, I do not think it has anything to do with electromagnetic interference. In my experience, the internal pullup is perfectly reliable for reading switches and push buttons, even on a breadboard with jumper wires acting as antennas. If you use pinMode() and digitalRead() instead of direct port access, you too will find the internal pullup is perfectly fine. In the table above, “X” means “don't care”. Each instruction takes effect at the beginning of the next CPU cycle, when the clock's rising edge commits the result of the instruction to the affected flip-flops. That's why the pullup turns on only at the beginning of cycle 3. Now, since the pin did read LOW, that means the PB5 flip-flop was LOW while the CPU was reading it, during cycle 5. This in turn means that the synchronizing latch before that flip-flop was LOW during cycle 4. Your expectation was for the pin to read HIGH. So let's see: how fast should the pin voltage have risen in order for the pin to indeed read HIGH? Since the input latch is transparent during the first half of each cycle, this means that the voltage should raise past the Schmitt trigger's threshold during cycle 3 and the first half cycle 4. So the rise time should be less than 1.5 cycles. 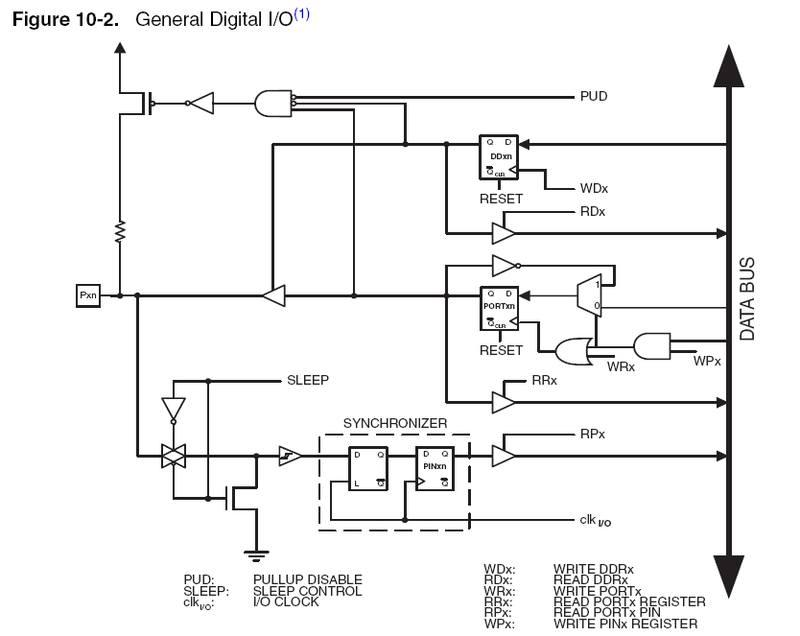 Or rather 1.5 cycles minus the combined propagation delay of the PORTB5 flip-flop and the logic that controls the pullup from that flip-flop's output. Probably around 90 ns. That's short! By now you have probably guessed: the culprit is not electromagnetic interference, it's stray capacitance. A simple calculation will show you that about three picofarads is enough to produce the effect you are seeing. This is the kind of stray capacitance you will find everywhere, even between the PCB traces of your Arduino board. Note that electromagnetic noise can add some unpredictability to what you see, as the pin is susceptible to it when it's completely floating, i.e. before you turn on the pullup, which makes the initial voltage (at the beginning of cycle 3) unpredictable. But once the pullup is on and the pin has settled, you won't care about noise anymore, unless it's unusually strong. The solution to your problem is simply to wait for the pullup to charge the stray capacitance. A microsecond delay should be enough to fix the issue. Alternatively, use the Arduino functions instead of direct port access: they are so slow that you will not need any extra delay. where in datasheet there is a warning about this gotcha? 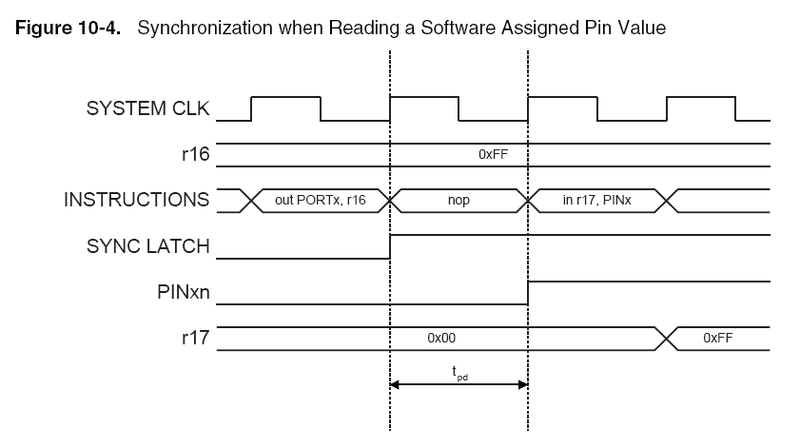 In section 18.2.4 – Reading the Pin Value: “[The synchronizing latch] is needed to avoid metastability if the physical pin changes value near the edge of the internal clock, but it also introduces a delay.” (emphasis mine). Edit: In a previous version of this answer, I incorrectly stated that sbi is a single cycle instruction, which required the voltage to rise in half a cycle instead of 1.5 cycles. The corrected timing is still short enough for stray capacitance to be a valid explanation of the observed behavior. The stray capacitance attached to the pin, together with the pullup resistor, for an RC circuit. As the pin is initially floating, it's initial voltage is unpredictable. When the pullup is turned on, the voltage starts to rise from whatever initial value it had to 5 V.
After some time, which can be typically of the order of the RC time constant, the input Schmitt trigger turns HIGH. After some extra delay introduced by the synchronizer, the PINxn flip-flop turns HIGH. If the CPU reads the PINx register before that happens, it gets a LOW reading. A test with an Arduino Uno. I used the usb connector to power-on the arduino uno. The led is at PB5, so I have exchanged PB0 and PB5. My test is therefor not the same. Using it next to my computer and phone, sometimes the led stays on. I can even find a spot behind my computer monitor (with CCFL backlight) where the led always turns on. Then I went outside, away from metals, wifi, and so on. The air humidity outside is 70% at the moment, which is high. I put it on a wooden table, so there is no charge by plastic. I used a battery to power the arduino uno. Then the led never turns on. In such a clean environment, the internal pullup resistor was probably strong enough to pull the pin high during that very short time. @IgorLiferenko, @sa_leinad gave the right answer. What you noticed is normal. It is totally normal. That behaviour can be expected. It will be worse when your circuit is not well designed. A oscilloscope will not help. As soon as you connect a oscilloscope, you have changed something. It will also be very hard to detect that very short time (less than a microsecond). In my opinion the influence by radio waves is only half of the problem. I think the electrical charge of the air, and the capacitive coupling of the wire with the air might have a larger effect. You have made an antenna with the 10cm wire and are receiving radio waves which is translating to voltages on your input pin. This is why you don't have the same trouble when the wire is not connected. According to www.csgnetwork.com/freqwavelengthcalc.html your 10cm wire is picking up frequencies of 750 MHz based on a quarter wavelength calculation. The datasheet states that the internal pull up resistance is roughly between 20K - 50K ohms. As mentioned in the comments, this is quite weak. The reason that this is not in the datasheet is because this is a general electronics/physics knowledge, not a characteristic of the micro-controller itself. When you change one bit of an IO port, you are either modifying the 8 bit register on which that bit is mapped using the WRx signal or just the 1 bit register for the pin alone using the WPx signal. When you use the WPx signal to set or clear the bit, you don't need to know the states of the other pins so the discussion ends here. However, when you use the WRx signal to MODIFY a single bit, you need to know the states of the other 7 bits which means that your need to read the 8 bit port. You can either read the port LATCH using the RRx signal or you can read the actual physical pins using the RPx signal. Now when using the RRx signal, no amount of loading or noise on the pins themselves will affect what is read from the output of the port latch but when using the RPx signal, if a previous write to the port is followed by a read of the port, any parasitics or noise on the OUTPUT pins may cause a pin that you think that you just set to a one suddenly becomes a zero. The reason this happens is because of how opcodes are pipelined. Writes to ports happen at the end of the last instruction clock but reads happen at the beginning so that there is essentially zero time between when you set that bit to a 1 and when you change some other bit (Read-modify-write fashion) so that bit is still a zero when it is read and then immediately written as a zero. Not the answer you're looking for? Browse other questions tagged atmega328 arduino-leonardo atmega32u4 or ask your own question. USB MIDI HID with the ATmega32u4?